The final Bakugan attribute symbol! Kidlet has been waiting for this one since I have never had a black marker. Well, now I do!!!!!!!!! My wonderful brother bought me a new set of food color markers for Christmas and they have many new colors in them! I'm not sure how I like them yet since I have only used them once. I will keep you posted. 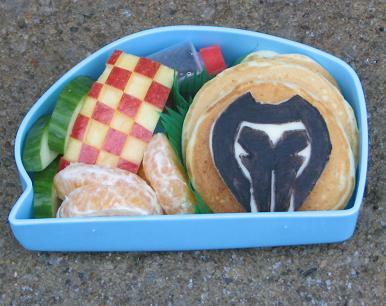 Kidlet has the Darkus symbol made from food color marker on cheese on top of buttermilk pancakes *yum*. On the side are a little bottle of syrup, checkered apple, clementine segments, and cucumber. Mix all ingredients, cook pancakes :D For bento size pancakes use a tablespoon to measure out the batter. Cute Darkus!! And good looking pancakes too. You make the most beautiful checkered apples. You have inspired me through your blog to start doing these for my kiddos as well, although they are girls and I am not as artistic as you. I have been researching bento boxes and have found so many cute ones. I would love to see the lids to your boxes..you seem to have somewhat of a collection yourself. That's so wonderful! I love getting more people interested in bento! It's such a great thing! I will gather and photograph my bento boxes this weekend. We do have some really cute ones!